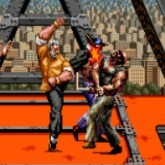 Description: Before there was Streets of rage there was an exclusive beat em up made by SEGA that came out to arcades. It was called D.D. Crew. A crazy fighting game with tons of action, however the gameplay wasn't that great lol. It was a nice learning experience I am sure for SEGA until better games were released in the genre. Oh well here it is enjoy!